Hello. I know it’s been forever since my last update. So sorry I’ve been gone so long. I know lots of bloggers not only keep blogging through the birth of their babies, but actually live blog their labor (yo, Bower Power!). I am, obviously, not one of those bloggers. However, I have been staying very busy. Of course, is any parent with a newborn not busy? Our Little Lady was born Feburary 12th. Labor with her was completely different than with Lil’ Man, but overall, I’d say it was easier. She is perfect in every way. Surprisingly she was born with medium brown hair and blue-grey eyes — my money would have been dark, dark brown hair and eyes, like her brother. Her hair is getting lighter, but her eyes are slowly turning brown. My family has mostly has babies born with dark eyes, so I’m kinda fascinated with her changing eye color. I love that they look like grey or blue in some light and brownish in others. Her brother adores her. I’m a little worried he might smother her with love. Literally. Yeah…he can get a little rough or overbearing so we have to keep a close eye on them, but seeing how protective he is over her is really heart-warming. Unfortunately, we have had some health problems in the past few months. 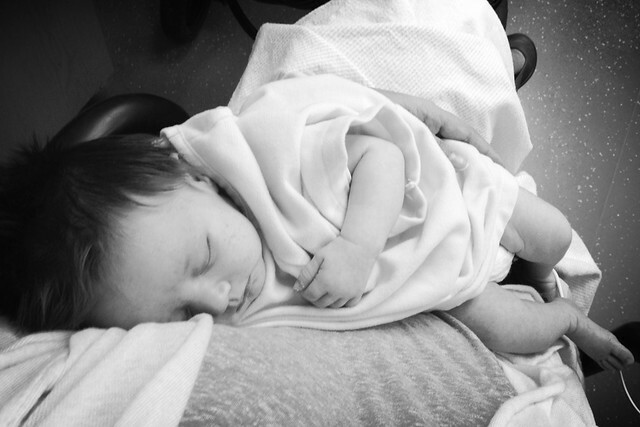 Little Lady had croup and bronchiolitis when she was only about a month old. All of this, plus a possible posterior tongue tie, was hindering her ability to breastfeed and she had some problems with gaining weight (a huge deal when you’re talking about newborns). We spent sometime in the ER. She makes hospital gowns look adorable. Then, Lil’ Man caught a cough and his asthma started to flare up. Both of my babies were sick. 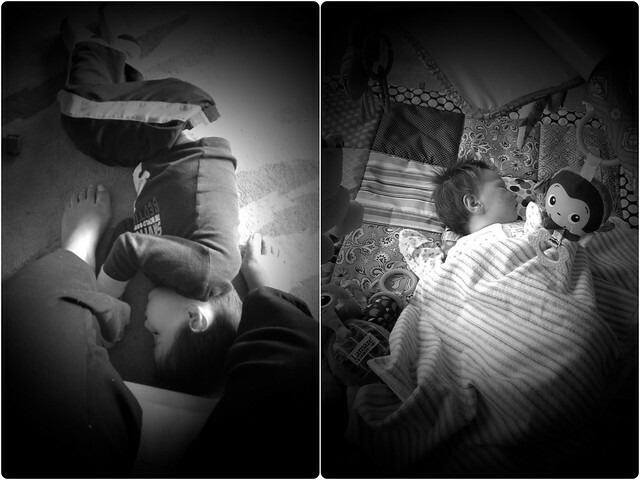 They both were so tired, they fell asleep just about anywhere. Thankfully, everyone is much better now, but it was a rough couple of months. During this time, we still tried to get some stuff done around the house. It was tough and sometimes I forget how much we’ve done. We have an awesome California King bed frame in our master bedroom, rearranged bookcases from room-to-room, swapped in new doorknobs through out the house, and reorganized our broom closet with hooks and elfa door shelves. 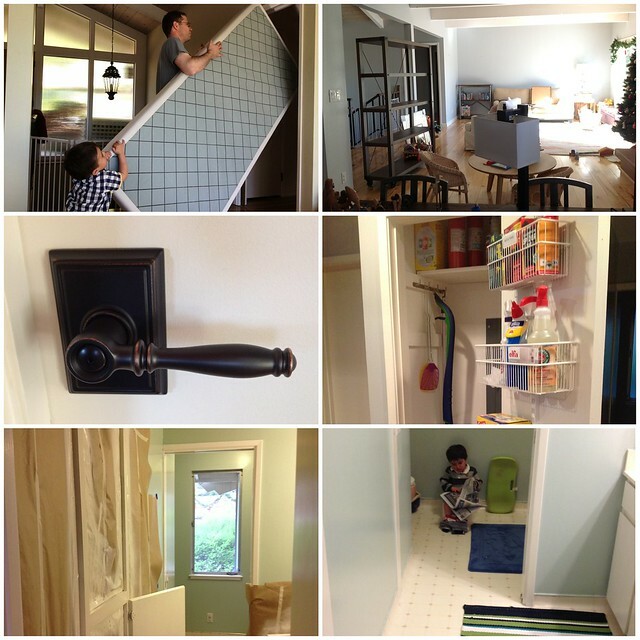 We also had the upstairs rooms and our blood-red laundry room painted to a more soothing palette of blues and greys. Oh, and we were are in the middle of potty training. Whoo hoo! We haven’t finished the nursery — we have a bassinet in our room still — but we are still making progress and there are lots of home projects throughout the house we’re working on. I don’t know how often I’ll be posting, but hopefully more often than now. As it is, I have to run because someone just woke up from her nap and is demanding to be changed and fed. No more school, no more books! 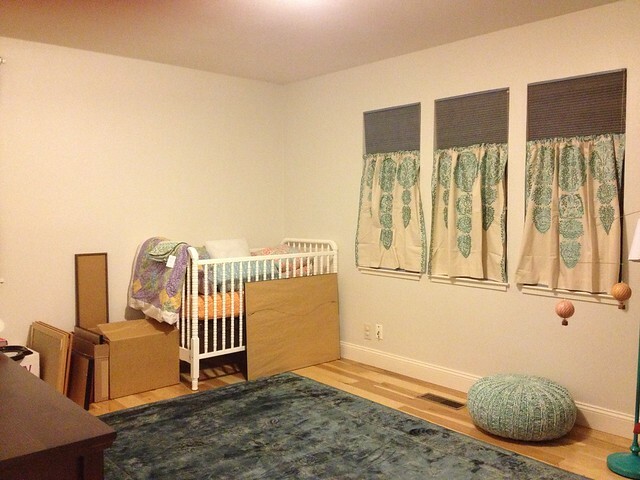 1) Get the new nursery in good order. 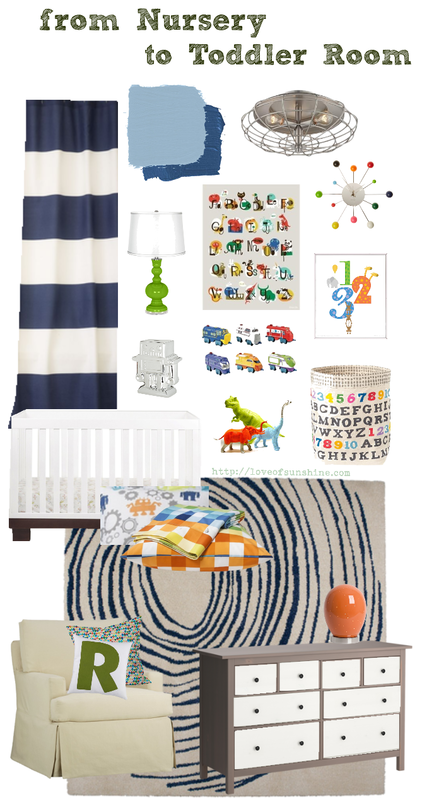 Now, this doesn’t mean decorate…I just want to get the sucker livable for our baby girl. Decorating and styling would be a bonus at this point. Since moving in, it’s become a dumping ground for every box, frame and piece of furniture we weren’t sure what to do with just yet. I have childproofed the door because I don’t think it’s safe for Lil’Man to wander in there by himself — it’s that bad. 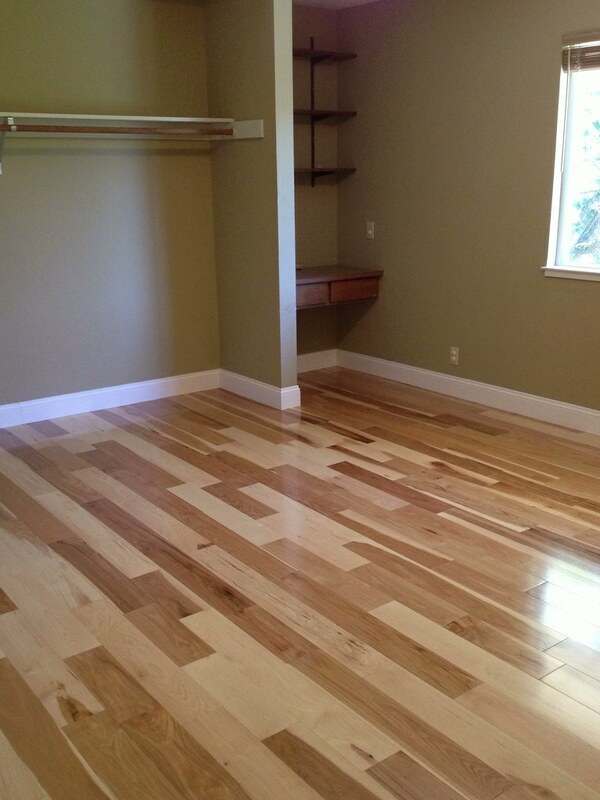 2) Make the offices/spare bedrooms comfortable. 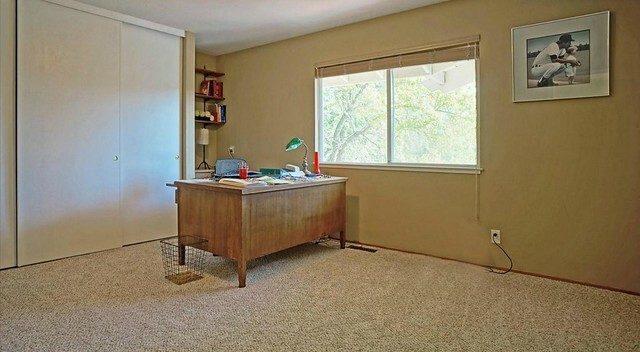 The Mr and I are lucky enough to have two spare bedrooms downstairs that we use as our offices (or man/woman caves, depending on who you ask). This is where our parents will be staying when they come to visit the newest member of our family. Unfortunately, neither room is very welcoming right now. That needs to change ASAP. Arrival dates for the grandparents have been set, so we’re on a deadline. There are a slew of other, smaller tasks I want to complete, but 80% of my efforts will probably go toward these two biggies. The nursery feels, simultaneously, somewhat urgent and not. This is because I know that newborns couldn’t care less what color their walls are or if they have the perfect room layout as long as they are warm, dry, fed and generally loved. Plus, we’ve discovered during this winter that the nursery gets COLD at night. During the day, it’s fine, but nighttime temps get to near freezing and that room does not hold onto heat. We think it’s a combination of a few things: it’s above the garage (which is basically a big, empty, cold space), the ceiling above it needs better insulation, and the windows are old and just plain drafty. We’ll obviously have to fix all this, but we can’t afford to do all that anytime soon. So, we plan to have our little lady stay in our room for a while. 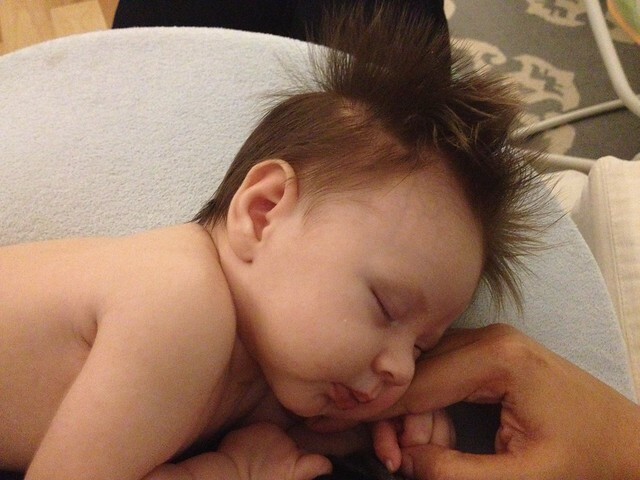 Lil’Man wasn’t a fan of his bassinet, but we’re hoping that his sister is more tolerant of sleeping in one. Hopefully, by the time she outgrows the bassinet, it will be spring and her room will be more comfortable. All that said, the nursery is in dire need of attention. 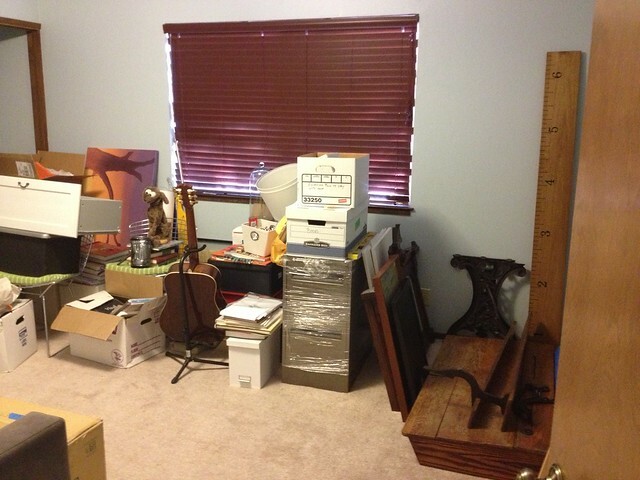 Most of the stuff in there belongs elsewhere in the house (or even, in a garage sale or donation drop-off). Besides, it would be nice to be able to put her down in her room during the day, even if it’s too cold at night. 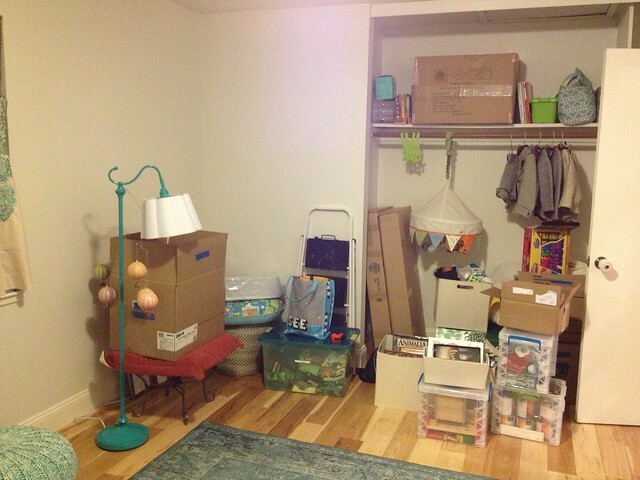 As for the spare bedrooms, both are packed full of boxes. The Mr’s room is in slightly better shape — we’ve had our parents visit and stay in that bedroom soon after we moved in, so it wasn’t as bad to start with. It’s accumulated a few more boxes recently, but the Mr is working on organizing all that and I’m letting him do his thing. My office, on the other hand, is a disaster zone. I haven’t organized a darn thing since we moved in or even emptied any of the boxes that the movers placed in that room. In fact, I’ve tossed a few more boxes and bags in there over the past few months which have blocked off any pathway through the room that might have once existed (this is a photo from before that happened). And thanks to said movers, I now have a broken antique desk that I still need to fix. It’s always needed a bit of love, but now it’s currently sitting in a corner in pieces, looking completely forlorn. My once beautiful desk is now filling the room with a vibe of hopelessness. Not good. I’m keeping my fingers crossed that this week is the start of a whirlwind effort to get these rooms in shape and the house, in general, in a good state. I’m also hoping that this wiggly little kid in my belly doesn’t decide to show up too early and throw off all our plans. Wish me luck! This past Christmas we visited the Mr’s family. That means tons of fun, food and general awesomeness. 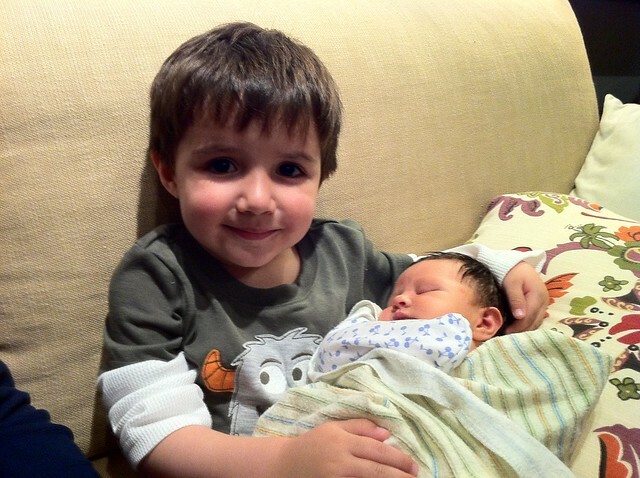 It was really great to see everyone, but especially to meet our new nephew who’s only 3 months old. Lil’Man in particular loved meeting him and we were thrilled to see how the two interacted. 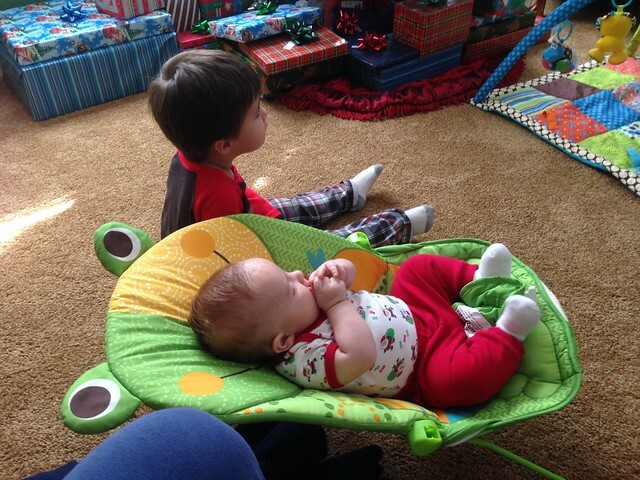 We still are teaching him to be gentle with his soon-to-arrive baby sister, but it was great to see that he showed a good deal of care around his little cousin. 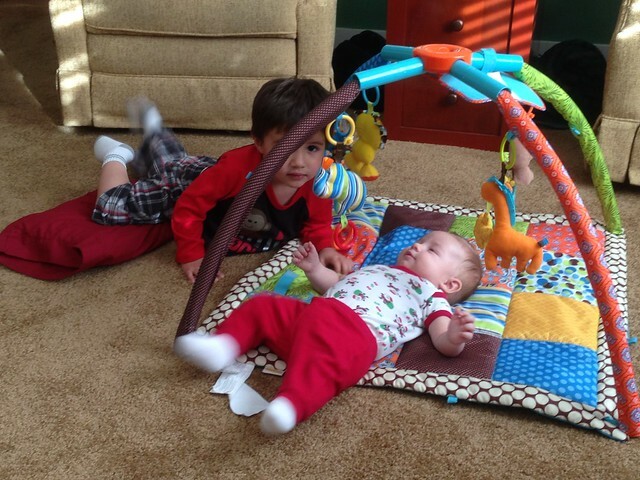 Anyhow…I was going to talk about cookies and got distracted by the warm fuzzies of seeing tiny cousins together. They were truly adorable. I was so caught up watching them, I never thought to grab my camera. I’m kicking myself for that now, because, cuteness! ETA: My sis-in-law took few pics of the cousins playing and watching cartoons while the Mr and I were on a movie date. Right…cookies. Well, Lil’ Man’s Mimi makes some of the best Christmas cookies ever. Plus, the sheer variety of cookies she bakes for the holidays is astounding. It’s not as if she makes a base dough and then makes a few, slightly varied cookies. No, they are all completely different classes of cookies. She claims she cut back this year, but there were still about a dozen types of totally different cookies to choose from. Usually Lil’Man’s favorite cookies involve chocolate and (as I was saying) he had quite the selection to choose from. Imagine my surprise when he repeatedly selected a cherry-studded cookie over chocolate chip! I was stunned, but pleasantly so. I love that my boy loves chocolate (especially given that the Mr is not a chocolate lover. Yeah, I don’t get it either) but I’m thrilled that he likes more than just the one flavor. Especially the fact that he likes sweet/tart flavors. Yay! His Mimi also noticed that he loved the cherry cookies, so before we left, she offered to send us off with some of the dried cherries she had left over. I jumped at the chance to take some home. As soon as she offered, I had it in my head that I was going to make a chocolate-cherry bread, but after browsing through recipes, I decided to make cookies. The best bread recipe I found was a sourdough. It looked amazing and I love sourdough, but the Mr decidedly does not. And, quite frankly, I didn’t think that we could finish a whole loaf, what with my not wanting to overload the kiddo with sugar, the Mr not loving chocolate, and my current dietary restrictions. No need to waste deliciousness, so cookies won out. I saw a sign somewhere that said something like, “Cookies that look like chocolate chip but turn out to be raisin are the reason I have trust issues. ” That is totally me. Oatmeal Raisin being the most common impostor, I always promised myself I’d make my own Oatmeal Chocolate Chip cookies. So, I made these. Turns out they just go above and beyond thanks to the tartness of the cherries. So yummy! Preheat oven to 350°F. Grease or line baking sheets. Whisk together flour, baking soda, cinnamon, and salt. Set aside. In a mixer bowl, cream butter and brown sugar until smooth. Add eggs one at a time, mixing after each addition. Add vanilla and almond extracts. Scoop tablespoon-sized balls of batter and drop onto prepared baking sheets. Bake for 10-12 minutes, or until bottom edges are lightly browned. Cool on pans for a few minutes (they’ll be too soft to move for a bit), then move to a wire rack to cool completely (they’ll crisp up just a little if you wait). My little man helped me make these (which mostly involved his watching the mixer and taste-testing along the way). He was Quality Control and sampled the chips and cherries before we added them to the dough. I was worried he might balk at the oatmeal, but he loves these cookies. So far the dough seems to freeze quite well which is a necessity in our house. I imagine that these would work well with any tart berry, so have fun experimenting!